Would you lie to your family? Break up with your best friend? Follow the boy you love into danger? I've written many books for grown ups and for teenagers in the chick lit vein and yes, although these books all have their dark and serious moments, they're generally quite light-hearted with plenty of laughs and happy endings. So Cross My Heart with it's World War Two setting, torture and work camp scenes is pretty different. All I can tell you is that I was just longing to write this story. I've always been fascinated by WW2. Half my family is German, half is British, so they experienced both sides of the war. I always wanted to know more about what it was really like to be alive at that time and to endure such difficult circumstances. What was Germany like back then? What was it like to live in a country occupied by the Nazis? 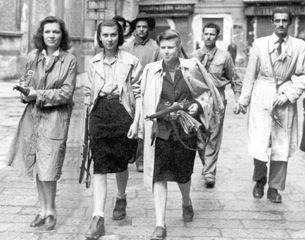 When I found out that young teenage girls were a very important part of the secret armies plotting against the Nazis, I just knew I had to discover more. So that's how Cross My Heart was born. Nicole goes from lookout to fully fledged bomber in a short space of time. She has to make difficult choices with terrible consequences and I wanted the violence in the book to feel real and frightening, not at all cartoon-ish. I was intrigued to learn that so many girls were involved in the Resistance. I suspect girls have been involved in war for much longer than we imagine. I really hope you'll give Cross My Heart a whirl, you'll love it and you'll learn something really interesting. It's very scary. And quite weepy. And also - sigh - very romantic.